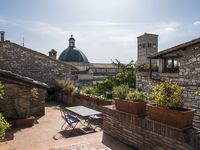 Properties in Gualdo Tadino average 4.7 out of 5 stars. Property 28: AssisiRelax apartment, spacious and bright. Love at first sight! Property 29: An apartment in a country house with a delightful view. Property 30: Close view of the biggest Christmas Tree in the world.